During a Greek Orthodox wedding, the exchange of wedding rings is a significant part of the ceremony. The bride and groom wear their rings as they approach the altar. The bride wears her engagement ring on her left ring finger, and both wear their wedding rings on their right ring fingers. In accord with one of the prayers in the Greek Orthodox Betrothal Service, the rings are placed on the right hand in observance of the rings of power, authority, and pledge worn by the Biblical figures Joseph, Daniel, and the prodigal son, who was given a ring to wear on his right hand as a symbol of compassion and celebration for his hoped-for return. The right hand symbolizes the establishment of truth and the source of strength, as well as the power and authority required to fulfill a pledge of commitment. After the priest explains the sacrament of marriage, the profound mystery of two becoming one while yet remaining unique individuals, he begins the very important blessing of the rings. Using the rings to make the sign of the Cross on the groom's forehead and then the bride's forehead, he repeats the following declaration three times: "The servant of God...(groom) is betrothed to the servant of God ... (bride) in the name of the Father, and of the Son, and of the Holy Spirit. Amen." He then reverses the order, beginning now with the bride's forehead and the bride's name, blessing the union three more times. He then places the rings once again on the bride's and groom's right ring fingers. Next, the couple's koumbaro (sponsor), a role filled in modern times by the best man or maid of honor, then steps forward to perform the exchange of rings. Crossing his/her hands, the koumbaro takes hold of the groom's ring in his/her right hand and the bride's ring in the left. Then, s/he slips the rings off their fingers and transfers them to the hand of the other person, back and forth three times. This exchange is made to symbolize that both lives are now interwoven, that one person's strengths will compensate for the weaknesses of the other, and that together their lives will be richer than if they were lived apart. 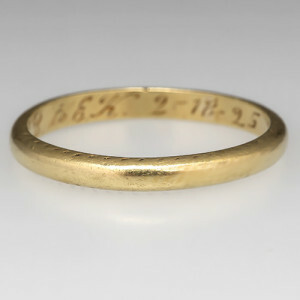 It has long been the custom of Greek couples to choose simple gold bands to serve as their wedding rings. Though some Greeks living abroad have been known to move the rings from their right hands to their left hands after the ceremony, others maintain the custom of wearing the wedding bands on the right hand. Princess Tatiana of Greece has been seen wearing on her left hand her sapphire and diamond halo engagement ring with an elegant diamond eternity band and a simple gold band, though on her wedding day she was wearing only her engagement ring on her left hand and a plain gold band on her right.